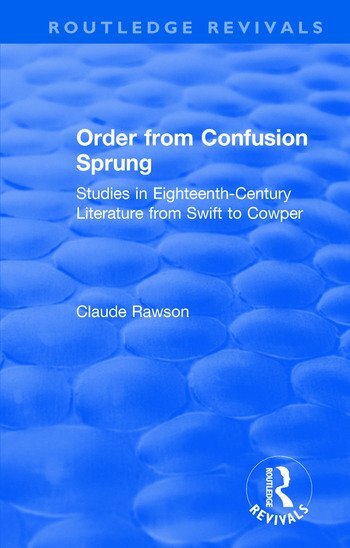 Originally published in 1985, Order From Confusion Sprung brings together some of Claude Rawson's more important essays and articles on eighteenth-century subjects, most belong to the last decade or so, but a few earlier pieces have also been included. Swift, Pope and Fielding are extensively treated, and there are discussions of Johnson, Boswell, Cowper, as well as some authors of the so-called Sentimental School. The volume also contains reappraisals of the concepts underlying such terms as 'neo-classic' and 'Augustan' in their application to eighteenth-century literature, and comments forthrightly on prevailing trends in the academic study of the subject in the last two decades. Claude Rawson is the author of several books on Swift, Fielding and other eighteenth-century authors, and of numerous articles and reviews both in specialist journals and in the Times Literary Supplement, New York Times Book Review and London Review of Books. He is General Editor of the Cambridge History of Literary Criticism, the Cambridge Edition of the Works of Jonathan Swift, the Blackwell Critical Biographies and the Unwin Critical Library.